Another heinous murder in the frozen north. In the tradition of modern Nordic crime fiction popularized by another Larsson, this is a stark, bloody book with strong female leads. There are two separate but related stories running parallel: the modern-day murder of a waitress and the tale of the victim's grandmother, who was murdered many years earlier. When a woman is found slain and her small grandson missing, Rebecka Martinsson, a prosecutor in cold, sometimes-barren Northern Sweden, once again teams up with detective Anna-Maria Mella to solve the crime. But when Martinsson crosses a vain and incompetent prosecutor who wants the case, he takes it over, and she goes on vacation. Though she's off the case, she hasn’t quit looking into it. She thinks there's a correlation between the killings of several members of the same family: The woman, her son, her father and grandmother all died under mysterious circumstances. As Martinsson gets closer to the truth, she and the victim's grandson become vulnerable, bringing them closer to danger and the truth about all the killings. 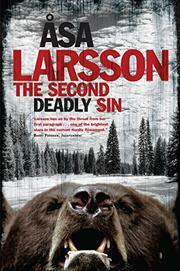 Larsson’s writings have the same dark and bloody bleakness that readers of Scandinavian crime fiction crave, and the details of the twin cases prove compelling. Even more interesting than the crimes themselves, though, are the day-to-day details of life in both present-day and turn-of-the-century Northern Sweden, where winter's brutality is a normal component of life. One warning: Sensitive readers may find some aspects of the novel disturbing. The real draws here are neither the crimes nor the accompanying mysteries, but rather the deeply compelling atmosphere. The translation proves odd and stiff in places, veering between American and British colloquialisms, but this glimpse into Swedish life in the boonies is fascinating.